In 2002, I wrote an email to a list saying, "Interestingly, the universal symbol of Christ in churches prior to the 9th Century was Jesus as the Good Shepherd. After that Council's decision, the universal symbol became Jesus crucified on the cross. Coincidence or deep truth?" I hoped to generate some discussion about the subject, as I had no other information about it than what I had read in a Rudolf Steiner lecture in which he expressed his perception of this change in the internal appearance of churches around the 8th to 9th centuries. When I visited Rome shortly afterward encountering that passage by Steiner, I looked and found no evidence to support the claim in any of the churches we visited because they were all post 9th Century churches or greatly modified since their original construction. I was left with an unanswered question and given an opening on this list, I thought it was a chance to open a discussion with knowledgeable parties on the topic. My hopes were dashed when I received but one reply which blasted my broaching of the subject, "It's really discouraging to see such an erroneous idea offered so confidently." It was really discouraging to me to have this kind of response to a post to a list. No one else replied. It made me wonder what kind of axe this person had to grind. There the matter lay until I found this book about four months later in a catalog and decided to order it. It claimed to have images of Christ throughout the two thousand years since his birth. Perhaps in here, I will find evidence one way or the other to confirm this situation. I am no expert on church art. I was merely passing on an idea I first encountered in Rudolf Steiner's works about one of the visible results of a sea change in the church authorities around the 8/9th centuries. I would imagine that the person who wrote this comment thought he was degrading me personally not Rudolf Steiner, but I wonder if his ardor for the task might have increased if he had known its source. 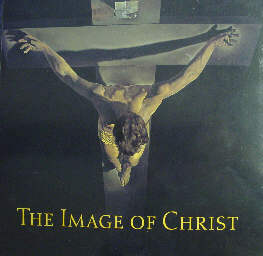 As luck would have it, I was able to acquire an amazing book that was published to accompany an exhibition at The National Gallery, London 26 Feb — 7 May 2000, called the Image of Christ. Here's a few items of note from this book which is full of images of Christ over the two millennia since his birth. The text [several authors for this museum piece] explains that since Christ Jesus and his followers were Jewish, no images of him were made while he was alive and for centuries later. [page 9] Some hundreds of years later, Christianity had attracted many non-Jewish converts. Yet although the prohibition against images was relaxed, fear of idolatry remained. The early Church had no cult images of Christ — nor did Christians have churches, as we understand them, in which to place such images. [page 10] The instrument of Christ's victory, the cross, was seldom represented; early Christians were reluctant to depict the gallows on which common criminals were executed. 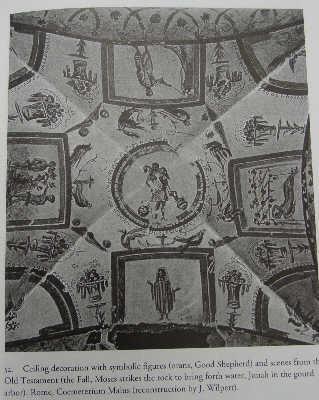 In the catacombs, they showed the cross covertly, for example in the crosspiece of a ship's anchor, emblem of hope (fig 3). 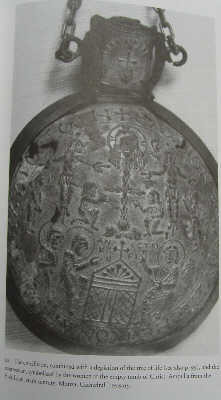 Accompanying the anchor, or as a sign within an inscription, we find the oldest symbol for Christ: the fish ( cat. No 4). The first emblem or symbol was the Chi-Rho emblem — the X with the P stuck through the middle that appears in many places in the Church. If you widen the top and bottom of the Chi or X, it begins to look like a cross in some artworks. 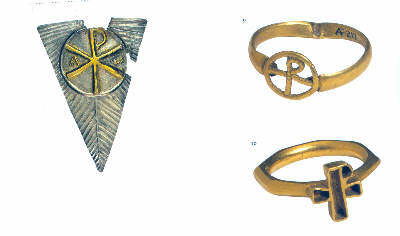 Chi-Rho represented the name "Christ" in the emblems and jewelry. [page 10] Early Christian artists drew on secular tradition not only for emblems such as the fish and the chi rho, but also when translating into visual form the verbal imagery of the Bible, notably the metaphors of Christ as the vine (JOHN 15:1, cat. No 20) and Christ the Good Shepherd (JOHN 10: 14-15; 27-28). 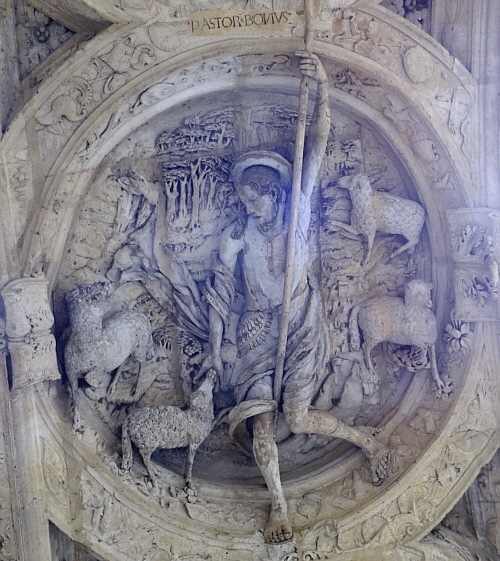 It's interesting to note that these early century Christians worked with visual symbols of metaphors, and the Good Shepherd was among their favorite. Why? [page 11] The early Christian Good Shepherd, who lays down his life for his sheep, is indistinguishable, except by context, from shepherds in the idyllic pictures of country life painted in Roman villas. He is young and beardless, dressed in the short tunic of a farm labourer. He usually carries a sheep across his shoulders, while other sheep stand trustingly by his side (cat. Nos. 1-3). [page 12] Depictions of the Good Shepherd became common from the third century AD, especially in the Roman catacombs, the ancient Christian cemeteries outside the city of Rome, where they appear in wall paintings and on sarcophagi and funerary slabs. The Good Shepherd images should not be understood as representations of the person of Christ but as visual renditions of the metaphor employed by him to cast light on his nature and mission. 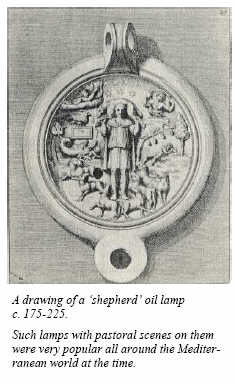 To my way of thinking a "visual rendition of a metaphor" is a visual rendition of a prevailing spiritual feeling that pervades the lives of the people who create the metaphor and it was this point to which I imagine Steiner directed his comment about the Good Shepherd. The National Gallery of London and its sources seem to agree with Dr. Steiner on this point. 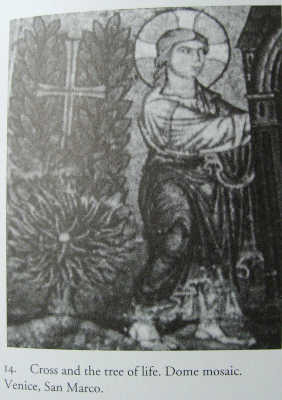 The book shows color plates of two Good Shepherd statues. The statues were renditions of the metaphor of the Good Shepherd, not Christ Jesus as a man — such a direct attempt to portray the Christ apparently did not occur to these early Christians. They did not focus on Jesus the man crucified on the cross like a common criminal so they did not make images of that aspect of his life in the 3 and 4th centuries. To them the cross as a common instrument of execution was as much an abomination as the electric chair to many today. 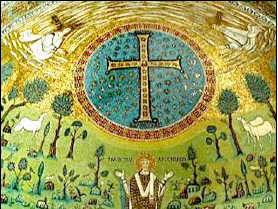 After Constantine won his battle as promised by Christ in a vision, he stopped persecuting Christians and the CHI RHO began to appear on his coins and his military banner, not as a cross but as an emblem of CH-Rist. It is easily mistaken as representing a cross, but it does so only coincidentally due to the X shape of the letter CHI. In some emblems the letter alpha appears in the left opening of the X and omega in the right side, but in others such as on page 22, the shape is more that of a P with a horizontal bar through it — looking ever so much like a cross, but really is the Chi Rho with the X filled in. This trend continues into the 5th and 6th centuries. [page 38] The earliest evidence for the use of the cross to symbolise Christ (but not the crucifix, which appears later) dates from before the end of the first century AD. 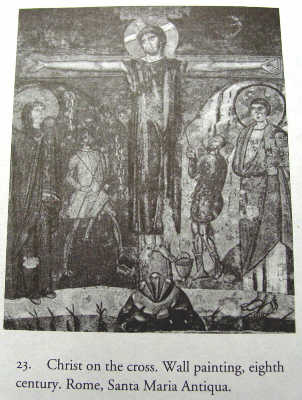 As I read through the rest of the book and checked images with dates, no images appear of Christ crucified on a cross before the San Clemente of Rome image of the 12th century. One of the reasons for a later dating of the door, up to the twelfth century, has to do with one of the finest panels of the Biblical History. That panel (pictured below) is found on the top course at the left edge. 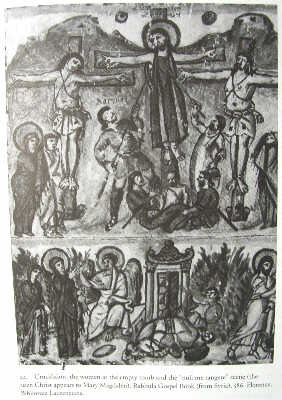 It is a crucifixion scene. 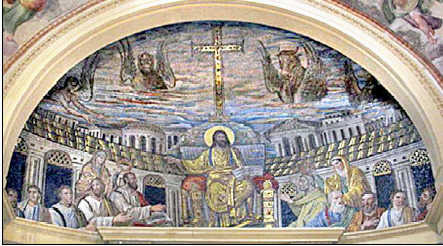 Here Jesus is pictured hanging between the two thieves, though on a larger scale. His head is lifted and turned slightly to His right, His eyes are open and fix on the beholder. This is not a closed investigation, just a preliminary foray to which I expect to add more notes as I do further research. I hope these notes have shed some light for others on the point that I attempted to make with my question, "Coincidence or deep truth?" I would say that the answer to my question is definitely "a deep truth" — where what I mean by deep is "something that brings light from the spiritual world". 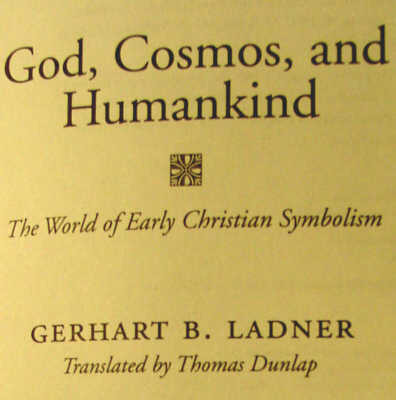 At the recommendation of a friend, I investigated the book God, Cosmos, and Humankind by Gerhart B. Ladner, 1995 which is filled with photos of early Christian churches, and other artifacts. 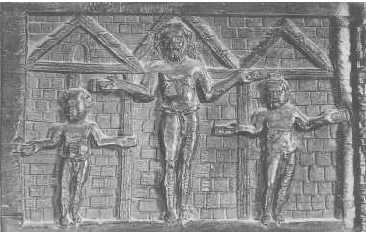 What I found supported the thesis that few if any images of Christ Jesus decorating churches appeared as a man suffering on a crucifix before the 8th Century. Below are some thumbnail size samples of photos from the book with descriptions of their location and time of creation. I found this statement in the book which reveals a projection of present day understanding of the cross unto to the earliest Christians — it represents an opinion that, rightly understood, does not fit with the photos of artifacts created before the 8/9 centuries that are shown in the book. [page 20] To all Christians, the cross was the symbol, the archetype and model, of self-renunciation and the readiness to suffer for God and humankind, even to give up one's life. Here are the examples we found which clearly showed Christ on a Crucifix. 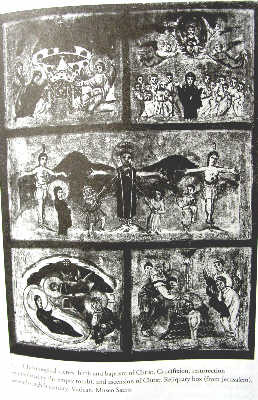 All were 8th Century or later images, except one illustration in a Gospel book. One was on a reliquary box. One a wall painting. The third was the illustration in a book of the Gospels — note that this item, from a book of the Gospels, is the only one prior to 8th Century which shows Christ Crucified. This is a book, not a Church decoration.